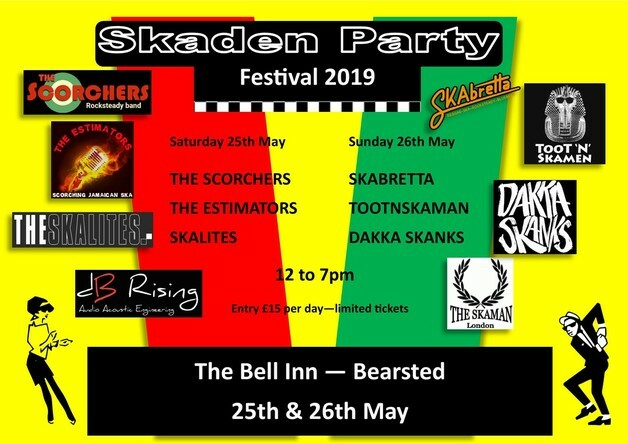 2 Days of pure Ska, Two Tone & Rocksteady Music provided by some of the best bands in the south east, we are holding the event over Saturday 25th may & Sunday 26th May 2019. Performances start from 12 noon to 7pm on both days on our new even bigger stage. Tickets will be £15 per day due to this year having an extra band per day, yep even more of this wonderful genre of music. We do have limited parking on a first come first serve basis, there will be a coned off e=area for bands to load and unload. There are plenty of streets with parking locally just be considerate to our locals. You are welcome to bring your own folding chairs if you like, we have bench seating & tables for around 100 but I am sure most of you will be dancing the day away..